Perhaps today you will head over to the community dining room for breakfast. As you make your way down the hall, you are greeted by the delicious aroma of a homemade meal and the carefree sounds of lively conversation. You think back to your first day at Dominican Village, where the kindness and compassion of the residents and staff made you feel welcome the moment you stepped through the doors. After breakfast you decide to take advantage of the complimentary transportation conveniently located right outside your building. On your way, you meet a few friendly Dominican Village staff members. Always available and willing to listen, they spend a few moments with you to discuss your plans for the day. Maybe you will visit friends, run a few errands, or just enjoy a scenic ride. The day’s activities are at your discretion here at Dominican Village, where there are no set schedules to keep. Later, you come home to spend the afternoon with friends in one of the many spacious recreational areas that Dominican Village has to offer. With so many activities to choose from and an open schedule, it is easy to maintain an active lifestyle that keeps you entertained throughout the day. As the afternoon progresses, you treat yourself to a refreshing cocktail in the lounge before dinner. Thoughts of a warm and inviting atmosphere and a delicious meal entice you to join residents and friends for an evening of fine company in the main dining room. There are always several entrees to select from and the full-service wait staff ensures that all of your needs are met. Your day concludes with a number of activities including bingo, movies, cards or games. Upon retiring to your apartment for the night, you reflect on your day’s events. It is comforting to know that wherever the day takes you, you will always return to loyal friends, caring and helpful staff, and a secure home that you can call your own. Imagine enjoying your waking moments in your apartment looking out across 13-acres of sprawling scenic greens at Dominican Village. While you sit and ponder the hours ahead, you hear a knock at the door. It’s your daily breakfast reminder from a friendly Dominican Village Personal Care Aide. As you make your way down the hall to breakfast, you are greeted by the delicious aroma of a homemade meal and the carefree sounds of lively conversation. You think back to your first day at Dominican Village, where the kindness and compassion of the residents and staff made you feel welcome the moment you stepped through the doors. In the beautifully decorated dining room, the full-service wait staff caters to your every need, such as adjusting your seat and reading the daily specials. After breakfast, you head back to your apartment to prepare for the day. Since you relaxed most of the day yesterday, today you decide to take advantage of the wide variety of activities available to you at Dominican Village. Your Personal Care Aide assists you in your preparation, with everything from showering and dressing to making the bed and doing the laundry for you. The aide can also remind you to take your medications, which are securely stored in a locked cabinet. Your day continues with a visit to the on-site salon, where you freshen up for tomorrow’s monthly birthday celebration in Helen Butler, O.P. Hall. You finish your appointment in perfect time for a visit to the on-site medical suite. It is so convenient having local doctors come in to administer care directly to the residents! On your way, you meet a few Dominican Village staff members. Always available and willing to listen, they spend a few moments with you in friendly conversation. Later, you join friends at lunch for another delicious & freshly prepared meal in the dining room. You’ve worked up quite an appetite after a busy morning. Perhaps this afternoon, you will just take a scenic ride to the east end of Long Island. 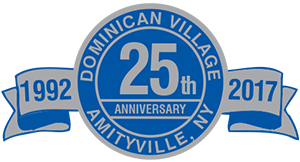 The complimentary transportation offered by Dominican Village is located right outside your building and the drivers and residents make the trip so pleasant and enjoyable. After the ride, you take a walk around the Dominican Village campus to enjoy the lovely patios and garden areas. Thoughts of a warm and inviting atmosphere and a delicious meal entice you to join residence and friends for an evening of fine company in the main dining room. With so many entrée choices, there is something to suit everyone’s tastes. Your day concludes with a number of activities including bingo, movies, cards or games. Upon retiring to your apartment for the night, you notice it has been vacuumed and cleaned while you were gone. Housekeeping does a wonderful job of keeping every room here immaculate. It is comforting to know that wherever the day takes you, you will always return to loyal friends, caring and helpful staff, and a secure home that you can call your own.